Small-scale businesses are taking the lead in the over-the-top content (OTT) service, Nguyen Viet Dung, general director of Viettel Telecom, said. 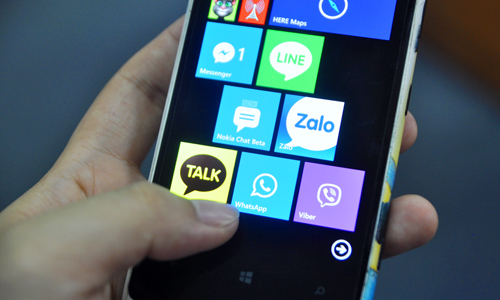 Dung said Over-The-Top (OTT) internet technology firm Zalo is now taking the lead in the OTT application in Viet Nam. The general director said the current trend in telecom services was changing rapidly. Previously, mobile phone providers held an exclusive position, but they are no longer exclusive providers. In addition, previous mobile apps must be sold through the current network providers. Today, application developers do not need to sell through network providers. They can sell their applications through app stores thus still ensuring high revenues. As a result, mobile phone service providers have to face and accept fair competition managed by foreign businesses or start-up businesses with a few employees. Currently the three largest mobile phone service providers, Viettel, VinaPhone, MobiFone are also offering OTT apps but they still fail to lure much users. One year ago, Viettel launched Mocha OTT applications amid numerous similar products that have taken a firm foothold in the market. After a year of operation, the Mocha application reached three million users. This was an unbelievable figure as it had to compete with the "big providers" such as Facebook Messenger, Viber, and Zalo. However, the three million users remain a modest figure compared to the number of OTT users currently. In 2015, Mobile carrier VinaPhone marketed its new app VietTalk to provide customers with more options for calling and texting via the Internet. VietTalk is the third OTT (over-the-top) service provided by a Vietnamese enterprise after Zalo of VNG and Btalk of Bkav. VinaPhone subscribers are free from 3G or GPRS charges if they use this app to make calls and send text messages to others using the new service. In August 2015, another Mobile carrier, MobiFone also launched a trial test of OTT app called Halo. Users are also offered 3G services. And earlier, in April 2014, BKAV Corporation also joined this OTT service by conducting Btalk with free calling and free messaging. However, Bkav currently has no official figures on the number of subscribers for this application. For VNG Corporation, since its launch at the end of 2012, Zalo has been rated highly by users for its voice message feature as well as its high and stable messaging. And now Zalo has at least 50 million app users. With such a figure, VNG has a number of subscribers that match the number of subscribers of the largest mobile phone provider in Viet Nam currently. A representative of the Ministry of Information and Communication (MIC) attributed the successful result of this service to continuous creation. Dung said with such results Internet services providers, and domestic telecom service providers should rapidly change their ideas to grow further. Irdeto, a world leader in digital platform security, has been selected by K+ to provide end-to-end multiscreen support for the launch of its first commercial over-the-top (OTT) service. K+ is a premium pay TV service by Viet Nam Satellite Digital Television (VSTV) which is now the largest satellite pay TV platform in Viet Nam with approximately 800,000 subscribers. Meanwhile, Irdeto's suite of multiscreen products includes Irdeto Rights, Irdeto Media Manager, and comprehensive implementation and managed services. By working with Irdeto and using enhanced user experiences and customised consumer facing applications supplied by Vodworks, K+ can offer their OTT content across multiple devices and browsers in a unique service for their market.